I shared this Desmos Activity Builder I made on Twitter, but never wrote a post about it. Oops! Let’s do that now. This activity is basically adapted from Sam’s Blermions post that I had helped him think about but he did all the hard work of creating questions and sequencing them. I’ve used the blermion lesson in the past and it went well, but that last part lacked the punch I was hoping for, having to work with analog points and compiling them together myself. But then I thought – wait, Desmos AB does overlays that will do this beautifully, if I can just figure out how to get the Computation Layer to do what I want. So I set to it. The pacing helped pause things to conjecture about what chormagons are – I stopped them at slide 5 so they can make those conjectures. I then advanced the pacing to 6 for the “surprise,” and 7-8 to make further conjectures. Look at some of theirs below. Then I showed them the overlay. Now Chormagons will lead right here. So this is an important tip if you use this DAB: make sure you change the name of the shape! Since Kate asked us to post more unsexy things, I thought I would throw up this review book I made for geometry, which basically covers all the things students should “know” (not necessarily be able to do, or deeper understandings) for the course, especially for the NY Regents (Common Core). The students can fill in the blanks and are then left with a nice study guide. So far my students seem to like it! (Although one student said they wouldn’t do it if they didn’t get a grade for it – so frustrating! Yesterday I introduce radians to my students for the first time. I started out by asking why they thought a circle had 360°. There were a few good answers – four right angles makes a circle, so 4*90 is 360; a degree is some object they measured in ancient Greece, and so a circle was made of 360 of them; something to do with the number of days in the year. All good answered, but I told them it was completely arbitrary based on the Babylonian number system. 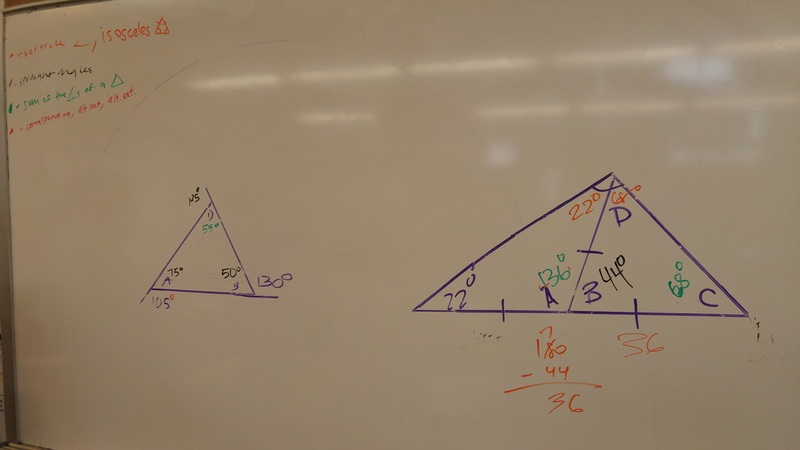 I was expecting 100 “degrees” to be the most common, so I was very surprised to see that most of the students want to split the triangle into two sections, each with 100 parts. I have been a proponent of tau for a while, as I thought it was natural to think of radians as pieces of a whole circle, but my students were clearly thinking of the circle as two semicircles right off the bat. I pushed the students who came up with the third way in a whole class discussion. If this whole semicircle is one student-name-degree, what would you call this section? And so we got to using fractions of those degrees. That made a pretty easy transition into radians. I went a little into the history; instead of using a degree, some mathematicians decided to use names based on the arc length – and so that semicircle’s angle was 1 π radians, instead of 1 student-name-degree. And the fractions we used were the same. This almost made me doubt my tau ways – maybe π was more natural. 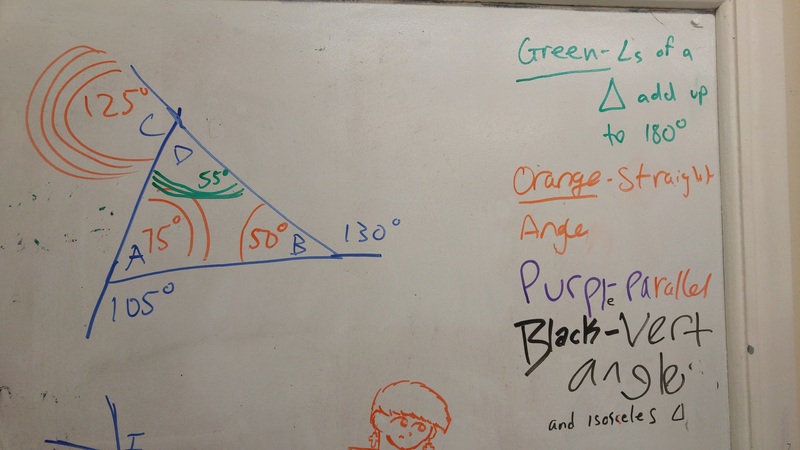 But then, as we started converting angles from degrees to radians, some students kept complaining that, for example, 90° was 1/2 π instead of 1/4, since it was clearly a quarter-circle – so maybe I can stay a tau-ist. On Friday our school was supposed to have a Quality Review, but it was canceled at the last minute. (That’s a whole ‘nother story.) But that pushed me to do a lesson that I probably wouldn’t’ve done otherwise, so that’s good. I actually think it went pretty well. 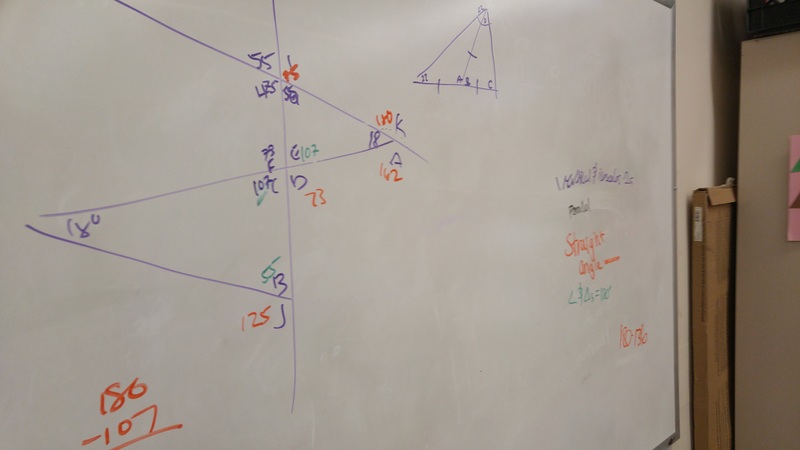 I noticed in our last exam that I should probably explicitly teach angle chasing as a problem solving strategy, so I asked the MTBoS for some good problems. Justin Lanier came through in the most wonderful way. So I picked out some problems into a nice sequence that would use a bunch of the theorems we’ve already done. Here’s some pics of their great work. Stressful as it is, I am loving teaching new courses. 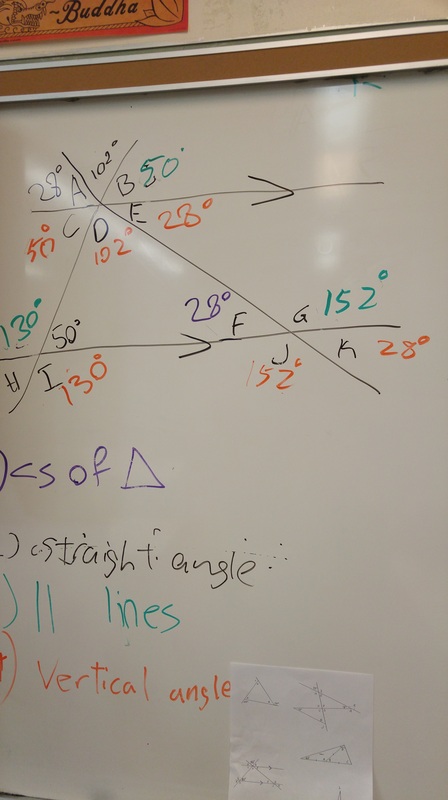 When I first start teaching, I felt like I was learning new stuff all the time, stuff about algebra (and how it connects to other courses) that I didn’t know I didn’t know, and now it keeps happening with geometry, especially with the more transformational tinge CC geometry has. One of the things that struck me was, last week, when I used this Illustrative Mathematics task as a follow-up to my lesson about the diagonals of quadrilaterals. 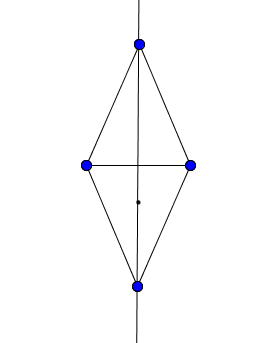 I feel like the understanding I had internalized that you can prove triangles congruent with less information because they are rigid structures, but quadrilaterals are not, so there are no quadrilateral congruence theorems. But I realized that’s not true. Last time, we constructed all of the special quadrilaterals by taking a triangle and applying a rigid motion transformation. 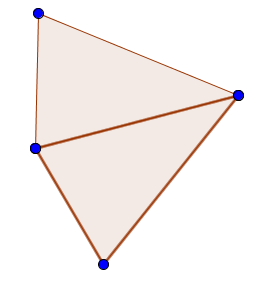 That meant that every special quadrilateral can be split into two congruent triangles. 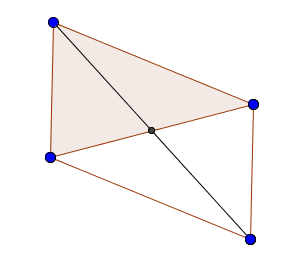 Therefore, if you had enough information to prove one pair of triangles is congruent, you could prove the whole quadrilaterals are congruent. So if we’re looking at SSSS in terms of the triangles, we really only know two sides of the triangles. 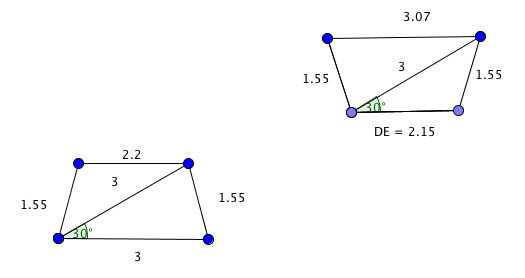 Since that’s not information to prove the triangles congruent, then it’s not enough for the parallelograms. But SAS is enough for the triangles, so it’s enough for the parallelograms. 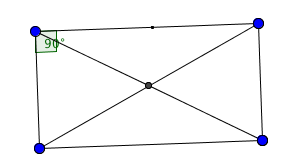 Here’s a non-parallelogram example. 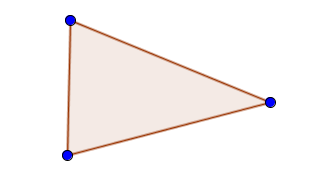 Here are two isosceles trapezoids with the same diagonals, same legs, and the same angle between the diagonals and one of the bases, but the trapezoids are not congruent. But that’s because, when you look at the triangles, we have Angle-Side-Side, which we all know is not a congruence theorem. 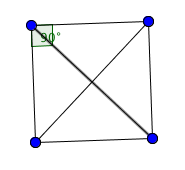 If, instead, we had had SSS (a leg, a base, and a diagonal), then they would be congruent.